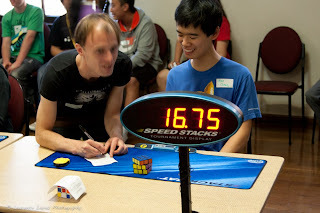 Saturday (21/4) was the Rubik's cube competition, which was the reason I chose to go to Sydney on that particular weekend. That day was quite eventful, perhaps a little way too much. 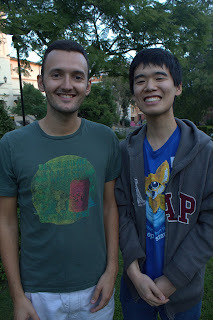 In the morning, I checked out of my hostel, and began my 4 km walk to the University of Sydney, where the competition would be taking place. Along the way, I learned that the Melbourne cubers (who had been planning to fly in to the competition that morning) had their flight delayed. Also, the competition could not start without the official World Cube Association delegate, who was one of the people stuck at the airport in Melbourne. So I decided to take my time on my walk, stopping to some pictures along the way. Somehow, I ended up walking for 2 whole hours! But eventually, I made it to the university! The University of Sydney has some really pretty buildings! I found my way to the competition. (Or rather, someone from the competition found me standing outside the building, lost!) The Melbourne cubers were still stuck at the airport. But everyone else was present, and they seemed to be having a good time! People were hanging out and cubing. Whoa! Look at all those puzzles! The organizers of the competition decided to start soon after I got there. 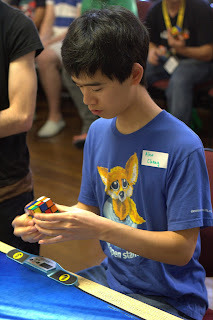 The Melbourne cubers were bringing the equipment for the competition (timers and displays), but some of us had brought our timers along, so we could use those. Without the delegate present, these rounds would not be officially recognized, but having an unofficial round is better than having nothing. But as it turned out, Edouard could act as the delegate until the official one came, so we were actually all set for the competition! Perfect! We had a round of 4x4 in the morning, followed by lunch, followed by 3x3 blindfolded afterwards. The competition seemed to be going pretty smoothly! Then the Melbourne cubers arrived around 2pm. We set up their equipment, and the competition proceeded in full speed afterwards with a 3x3 round and finishing with a 2x2 round. What a great competition! I suppose you could look at it as a disaster, because the Melbourne cubers had been delayed at the airport, and that ruined what was originally planned. But it was very nice seeing everyone in Sydney work together to keep the competition going! I think this made it a very successful competition, not to mention a very unique one! In the morning when one of the organizers asked me if I had a timer, I thought for a bit, and realized that the answer was... yes! When I was packing in Melbourne, I had spent a few minutes deciding whether to pack my timer. I had been concerned about bringing too many things over. But then I realized I could ask Edouard to sign it! (I already had it signed by two other world record holders at Melbourne Summer 2012.) For that reason alone, I ended up bringing that timer. And we used to it run the competition in the morning! Thank you Edouard for getting me to bring my timer!